When ordering new sails, the customer’s fairly loose attitude to the issue of dimensions is quite common. A common response to the question about the dimensions of the new sails that we are to make, is – “I have typical rigging dimensions, make it according to typical dimensions”. Fine then, we sew the sails according to typical dimensions. The customer picks up the sails. Satisfied with the new toy, he puts them on his boat …… and the horror starts. Mainsail – the luff is longer by 30 cm, the foot shorter by 40 cm. Foresail rolled on a rigid stay – the luff is shorter by 50 cm, the clew instead of 30 cm above the traveller track turns out to be about 45 cm above the track. All in all, the foresail can be used, the mainsail must be shortened. This is not a terrible operation on the “patient,” but it result in a mainsail which no longer brand new and perfect, but one that was cut up to fit. There are some sailors, for whom this is of no importance, but there are also those who will treat this matter very emotionally. After all, the sails were to be new, after fifteen years of sailing with wind torn old sails, patched over and over. It’s like buying your first new car and two days later it turns out that you need to replace the fender and door. At this point, this is no longer a new car. The same is with sails. Dear reader – first try to assess these sails yourself. What is done well, what could be improved and what is wrong. And now my comments on the subject. The foot could be about 10 cm longer. The luff is fine – the distance from the halyard head to the lashing block of the mainsail halyard is correct. The leech is okay, the boom is neither facing the sky or the deck (and hitting the crew’s heads). 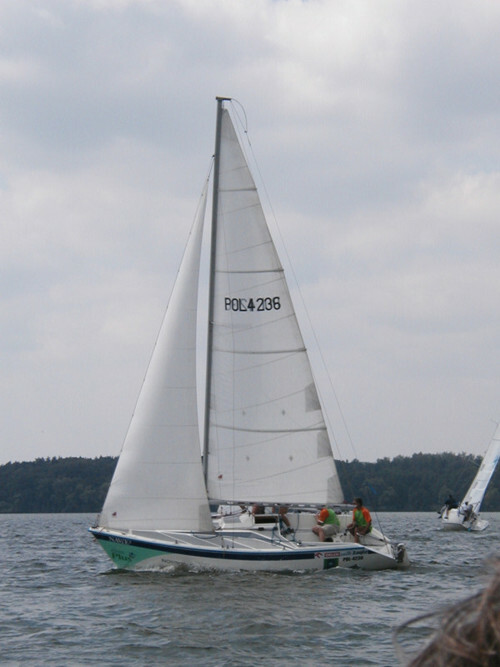 Full battens – a good decision – more comfortable sailing with a well profiled and stable sail. In addition, the battens are stretched properly, you cannot see the tabs on the batten pockets that occur when the battens are not tight, and are transferred onto the sail in the form of wrinkles. Two reefs – a good decision if someone is going to use them if they have the ability to make quick decisions while sailing in strong winds. One note – you can see in the photo that not even one of the reefs is prepared for quick reefing. The winds on the lakes are quite unpredictable. Within a few minutes the wind force may increase by a few degrees on the Beaufort scale, which certainly qualifies for reefing.Of course you can try to fight with full sails, but it is simply harmful to the “health” of the boat and the sails, not to mention the actual health of the crew. Sometimes I hear the explanation for the lack of a prepared reef – “but the shore is so close”. I leave this without a comment. Sail trim – correct, sail edges were heaved in correctly, without unnecessary slack, which deepens the sail profile. And in this particular case we can see that the boat sails close-hauled and the additional depth of the sail is not necessary. Numbers – are present, which means that they were needed. However, it is clear that the way they are attached is wrong (shining through). In this case, the numbers were sent to the customer after the sails were made and he personally attached them to the mainsail. He probably noticed that something went wrong when on the water, but did not re-attached them, probably fearing that after this they will no longer stick well to the sail. Topping lift hooked onto the boom end – this is a rather bad idea. You can see that it bends the mainsail leech between the first and second upper batten. Its continuous use will lead to the tearing the edge of the leech, especially the ends of pockets, which are the most protruding part on the leech. The luff could be about 30 cm longer upwards. The leech – it is fine downwards, but upwards it could also be extended by 30 cm. The foot could be about 30 cm longer. Position of the clew relative to the traveller track (top-down) is fine. Sail slides are visible on the luff. You cannot see it, but a soft rope (not steel) is sewn into the luff. As a result, the trim of such a luff always depends on the attention of the crew when sailing. Here, the crew took care of the luff trim properly (which does not happen often), you don’t see any “curtains”!!! Rarely do I see such a trim of the foresail luff with sail slides. The rest of the sail is also trimmed properly. There are some shortcomings in terms of dimensions, but they are not overbearing. Sails are used in a thoughtful and appropriate manner. This gives us a picture of the user who had a conscious approach to the design of the sails and also uses them consciously. The combination of these two factors (an exact order for sewing sail and their reasonable use) will translate into a long, repair-free use of the sails. And this is what I wish for you (taking away my livelihood in the form of the need for making new sails to replace destroyed ones). When ordering new sails, most sailmaker’s shops will suggest you fill out order forms. Often our customers are scared: “So many questions? This looks so complicated!” Let me explain – it is not necessary to fill out everything. It depends on the needs. But generally we can assume that the more information, the more accurately the sails will be made. They will be closer to the individual customer requirements. Gone are the wonderful times where the customer had to take what was on the shelf or nothing at all. Today, almost all sets of sails are different from each other, by smaller or greater detail, but different. So do not be afraid to open up your imagination and take a bit of effort to make these new long-awaited sails as close as possible to your ideas.